On the next day, enjoy the sand and surf at Gwangalli Beach, kick back and relax at Haeundae Beach, and then get a taste of the local shopping with Shinsegae Dept. Store Centum City. You can plan Busan trip in no time by asking Inspirock to help create your itinerary. Detroit, USA to Busan is an approximately 20-hour flight. You can also do a combination of flight and train; or do a combination of bus and flight. Due to the time zone difference, you'll lose 14 hours traveling from Detroit to Busan. 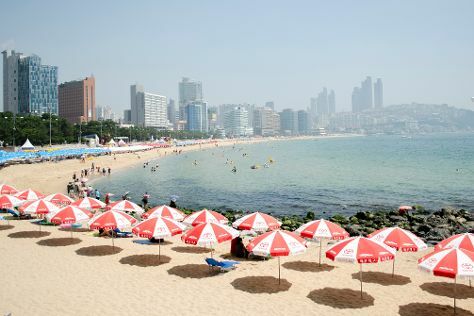 Traveling from Detroit in September, plan for somewhat warmer nights in Busan, with lows around 65°F. Cap off your sightseeing on the 1st (Mon) early enough to travel to Seogwipo. Eschew the tourist crowds and head to Sangumburi Crater and Daepo Haean Jusangjeolli Cliff. Satisfy your inner culture vulture at Hallim Park and Teddy Bear Museum Jeju. 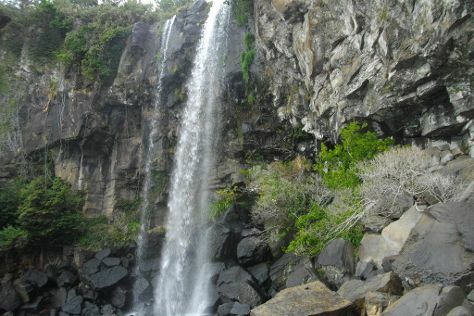 Explore Seogwipo's surroundings by going to Jeju (Halla Mountain, Hyeopjae Beach, & more). Next up on the itinerary: take in the dramatic scenery at Jeongbang Waterfall, examine the collection at Alive Museum, and take in the dramatic natural features at Hwangwooji Coast. For reviews, where to stay, ratings, and more tourist information, use the Seogwipo trip itinerary builder tool . You can do a combination of flight and bus from Busan to Seogwipo in 4 hours. Other options are to do a combination of train, taxi, flight, and bus; or do a combination of train, flight, and bus. Plan for a bit warmer nights when traveling from Busan in October since evenings lows in Seogwipo dip to 68°F. Wrap up your sightseeing on the 5th (Fri) to allow time to travel to Gyeongju. On the 6th (Sat), contemplate in the serene atmosphere at Seokguram, then contemplate the long history of Bulguksa Temple, and then examine the collection at Gyeongju National Museum. Keep things going the next day: contemplate the long history of Cheonmachong Tomb, contemplate the long history of Gyeongju Historic Area, then steep yourself in history at Cheomseongdae Observatory, then contemplate the waterfront views at Anapji Pond, and finally contemplate the long history of Donggung Palace & Wolji Pond. For other places to visit, maps, ratings, and more tourist information, read Gyeongju route maker website . You can do a combination of bus, flight, taxi, and train from Seogwipo to Gyeongju in 4.5 hours. Alternatively, you can do a combination of bus and flight; or do a combination of bus, flight, and train. Traveling from Seogwipo in October, plan for a bit cooler nights in Gyeongju, with lows around 60°F. Wrap up your sightseeing on the 7th (Sun) to allow time to drive to Sokcho. Kick off your visit on the 8th (Mon): explore the striking landscape of Seoraksan National Park. On the 9th (Tue), you'll have a packed day of sightseeing: hunt for treasures at Sokcho Jungang Market, then take in the spiritual surroundings of Naksansa Temple, and then trek along Ulsanbawi Rock. For other places to visit, reviews, ratings, and other tourist information, go to the Sokcho trip itinerary builder tool . You can drive from Gyeongju to Sokcho in 4 hours. Other options are to do a combination of train and bus; or do a combination of train, taxi, flight, and bus. October in Sokcho sees daily highs of 66°F and lows of 60°F at night. Finish up your sightseeing early on the 9th (Tue) so you can go by car to Seoul. Visiting Cheonggyecheon Stream and Bukhansan National Park will get you outdoors. Your cultural itinerary includes sights like Myeongdong Shopping Street and Gyeongbokgung Palace. There's lots more to do: step into the grandiose world of Changdeokgung Palace, brush up on your military savvy at The War Memorial of Korea, take some stellar pictures from N Seoul Tower, and take an in-depth tour of National Museum of Korea. For traveler tips, other places to visit, photos, and other tourist information, read our Seoul trip itinerary planning site . You can drive from Sokcho to Seoul in 2.5 hours. Alternatively, you can take a bus. Expect a daytime high around 66°F in October, and nighttime lows around 65°F. Wrap up your sightseeing on the 12th (Fri) to allow time to travel back home.